. Despite the fact that the documentation of this part of hybris is not bad, I took some notes that formed the core of this article. UserId is a directory and _.xml is a template used for naming.
. It is an easiest part and well-documented.
. It seems that this context is deprecated and decomissioned. advancedSearch. It is used in wizards, Reference Selector, Browse item page. The Advanced Search dialog box is displayed after clicking on the “Browse” button in the cockpit content browser. gridView. Defines what attributes of the type are used for the thumbnail, title and description to build a navigation grid. gridViewPersonalize. Grid view in Personalization view. listViewContentBrowser – search result list view configuration for content area. As you see from the table above, each context is associated with a Factory that creates the actual configuration object from a JAXB object. Each Factory defines the allowed tags (see below). to fetch the configuration for the component. This call is injected into component implementations (differently for different components). Later those components refer to the derivatives of UIComponentConfiguration to change the way how components are rendered. In the most cases the object template code is a name of the hybris item type. In the video I open two same-typed product one after another and you will see that some fields are not displayed. All configuration files are XMLs. They refer to XML XSD that is also available in the same directory where XMLs are. It is overkill to list here all syntax rules for all these tags. You can use *.xsd files located in the same directory (resources/-config/). 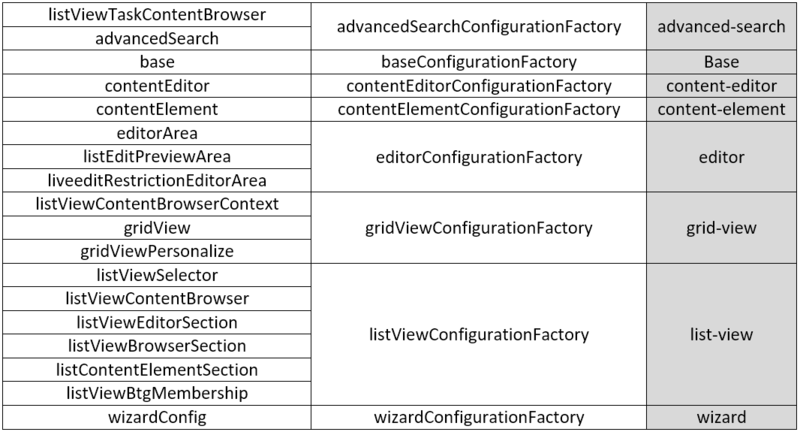 They contain all tags and attributes for all listed types of configuration. ), the configuration from XML is taken into account by the system to display the component accordingly with the configuration. However, you can have different versions of the configuration for different roles/users. 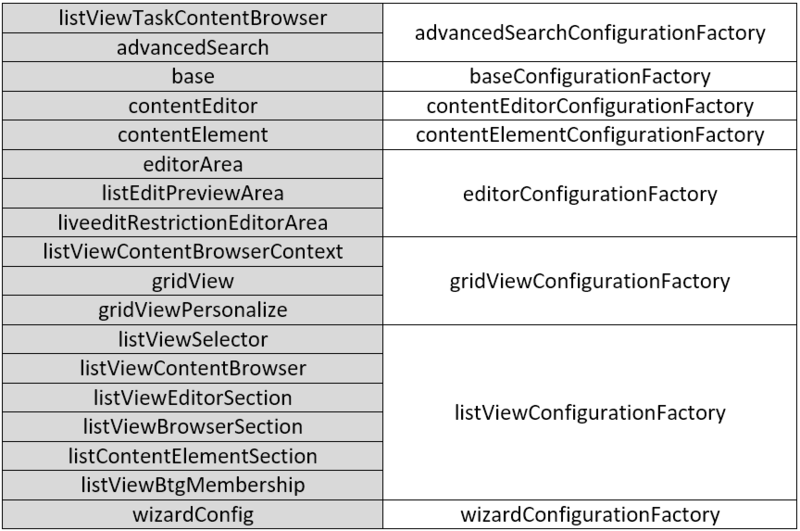 There is a logic behind the scenes on how these configurations are selected for the particular role and userId. First,the system tries to apply the current logged user specific configuration. If failed, the system tries to apply the role-specific configuration. For example, for all admins (“admingroup”). If succeeded, the system skip the further steps.Otherwise the system tries to identify and apply the configuration from the user group configured as “fallback role”. Finally, hybris tries to load configuration that is not connected to any roles or users. allowCreate. The administrator will be able to create new items of the specified type (only select existing). Used with Reference Selector. predefinedValuesStrategy. Fills predefined values for Item. restrictToCreateTypes. Allows only specific types (subtypes) to create. defaultValueResolver. Is it used to get a default value for a wizard property. label_. Defines a label for an attribute for a wizard (for a row in a group). allowSelect. Allows selecting rows. Used with Reference Selector. Mark field as optional (true)/required (false) in the wizard. allowAutocompletion. Allows autocomplete in collection and reference editors. optional. Mark field as optional (true)/required (false) in the wizard. autocompletionSearchType. The type is used for autocompletion. sclass. For shortListEditor. ZK Style name. constraint. For shortListEditor. For constraint=strict you will need to enter the valid value in the field. inline. The wysiwyg editor is displayed inside the editor area. rows. A number of rows of the editor in the editorArea. The default way to activate the XML configuration is performing an HAC Update. ← hybris Cockpit Framework Expert Customization Explained. Part I.